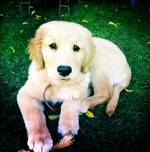 "I have but 2 words for Hudson Shock,,, A Mazing :) I, being a first time dog owner, was completely in over my head when we got our golden retriever puppy for Christmas. Hudson began working with our pup and literally within MINUTES Bucky was obeying commands! After only 2 weeks of training and doing everything Hudson suggested, we now have a well behaved, wonderful dog! In fact, I'm often complimented by passersby who say, "Wow! What an amazingly well behaved dog! Who trained him?" HUDSON SHOCK! Hudson is professional, dependable, and really knows how to communicate with and get amazing results from your dog! He puts the BEST in Best Dogs Ever training! Highly recommend!" "A lady asked me on my hike today if I was a professional dog trainer! LOL!! NO! but... I learned the techniques I'm using from Hudson Shock at Best Dogs Ever and highly recommend him!" "Hudson knows dogs, and he's good with people too. Hudson taught my family how to train and handle a 150lbs. English Mastiff. She was food crazy and use to grab food off the kitchen table. Now everyone that meets her are impressed with how behaved she is, and the tricks Hudson worked with us on. For private training with a professional, Hudson Shock is your guy. We also inherited a small terrier mix through the passing of relatives and at the time we adopted Woody (8.5 years old), he was only able to be handled safely by animal control. This was a dog who for years was feared by the family and locked away each time we came to visit. He's bitten an ankle once or twice and was even asked to leave a dog park. The night we brought Woody home, in a crate, we immediately phoned Hudson Hudson came over that night and gave us tips on how to begin Woody's healing so he could be a part of our family. We worked with Woody the same as we worked with Madison, with a few tweaks due to Woody's fear and aggression, and today Woody sleeps with our daughter, walks like a champ, sits and stays on command, and no longer feels the need to hide under furniture. He is a work in progress and though he is still a bit uncertain of strangers and gives the occasional growl, he travels with us, visits the homes of our friends, has finally met and befriended other dogs and has a new lease on life. Our little Woody is a new man. Hudson's approach not only worked for our 150lb. exuberant Mastiff, but he managed to help the healing of our terrified 10lb terrier." "Hudson I wanted to tell you about a great experience I had with my dog as a result of your training. I took Bailey into the bank with me the other day only intending to use the ATM but instead had to wait in a Teller line for about 15 minutes. Realizing that I might be asked to leave, I had to keep Bailey on her best behavior. Utilizing the hand signals for "sit" and "lie-down" I was able to not only keep Bailey calm and quiet but also succeeded in amazing myself as well others in the line with me. If Bailey got a little fidgety I would use the "touch" command to bring her back into the moment. This was the first "true" test of Bailey's training and I must say that I was amazed. I could clearly see that she was happier and more calm knowing that I was in control of her. I believe this kind of training can keep a pet safe under certain circumstances and remove anxiety on the part of the owner as well." "Hudson Shock is highly recommended! My girlfriend and I have a rather large, rather emotional, rather excitable Rhodesian Ridgeback. A sweetheart of a dog but as is the nature of the breed, somewhat uncontrollable. Hudson came in and made Oliver a civilized creature. Our dog is still excitable but we now have the tools to calm him and stop him jumping up at humans and other dogs. These tools are worth their weight in gold. Hudson is extremely professional and loves his work. But most importantly he has a way with animals. Our dog loves him, and looks forward to his visits. We had no idea what to do and assumed our dog would rule over us. Not so now. 10 stars if it were possible." "[Hudson Shock] is just absolutely wonderful at what he does. He's very knowledgeable and patient- really taking the time to explain his techniques, commands and exercises. He is extremely thorough in his research about the dog's history, environment and issues. We feel when we're working with him that he really has a comprehensive understanding of our needs. We saw results immediately and then also working with our dog on our own following his long term recommendations. He has a caring and compassionate philosophy which really hit home with us and our dog. 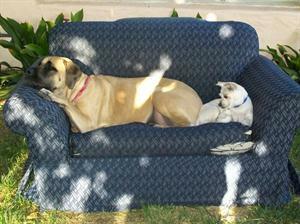 We would recommend him to anyone looking to solve any issues that they may have living with their dog." 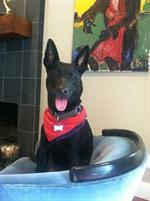 "We engaged Hudson to train a very rambunctious six month old lab mix. Over the course of 90 minutes, we worked and played with Kirby and she began to respond to direction immediately. Hudson has an excellent understanding of dog behavior and psychology. He offered great insight into simple methods to get maximum results without any negative reinforcement. By the time Hudson left, Kirby had made substantial progress and, perhaps equally importantly, we had some very useful tools to continue that progress over the months and years ahead. Finally, Hudson has kindly followed up with us via email to track our progress and offer tips and insight where needed. He has been a fantastic resource and I would not hesitate to recommend him to anyone looking for a great trainer and solid lasting results for their dog." "My husband and I rescued a 7 month old Terrier. Super high energy with NO training whatsoever. We had a dog before and thought this should be a breeze. It wasn't I thought what have we done, we can't keep him. I found Hudson Shock "Best Dogs Ever" HE IS A GOD!!! He taught us how to be consistent, diligent, set major boundaries while he worked on Digby. Our littler terrier chased our cats and had no social skills. Now he knows a slew of commands is warming up to kitties and is a member our house that we can feel proud of. What I love about Hudson's teaching is that he gets inside the dogs brain and almost rewires it by rewarding good behavior. Rather than using force and instilling fear to teach, he does it in a much healthier way that produces the best results." "Hudson Shock worked with me to train my 4-month-old German shepherd/lab mix puppy and I was very pleased with the result we got - and in a short period of time. His technique is humane and gentle and he seems to understand what goes on in a puppy's head and how to reach them. He made the training fun and enjoyable and I highly recommend him." Hudson really helped us teach our wildly enthusiastic rescue puggle into a happy little gentleman. Each session we learned something new and developed a better relationship with our pet. Definitely worth the time and effort. My husband and I have an extremely vivacious 10-month-old male Labrador puppy. We were getting frustrated with our attempts to train him, so a friend recommended Hudson at Best Dogs Ever. We met with Hudson and Amanda for our initial consultation, and Amanda has taken the lead with our training from there. My husband and I are both busy with work, so we did the Day Training, which has been fantastic! Our puppy has learned SO quickly under Amanda's guidance. We have been so impressed with both Amanda and Hudson and we can't praise them enough for the positive training and coaching they have provided us!! Our puppy is much happier and so are we! 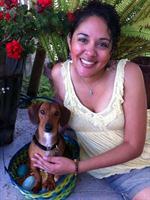 We would recommend Amanda and Hudson to anyone - they are both knowledgeable, thoughtful and caring trainers. My husband and I were seeing unusual behavioral issues in our dog Kuma. After doing lots of research and seeing convincing reviews, I decided to call Hudson at Best Dogs Ever. From the first time we spoke on the phone, I could tell he knew his stuff. He had me explain what had been going and gave me helpful tips right there on the phone, all before the first meeting. We had two sessions. Only two. I've been applying what I learned from Hudson in the daily routines, and I am seeing positive results already. Honestly, I wasn't expecting the training to work so fast, but it did. My dog is behaving much better. Most importantly, my husband and I learned to be a better owner. Thank you, Hudson! Hudson has really helped us with our unruly pup. He knows what he's doing and I would highly recommend him to anyone! Hudson helped my dog aggressive and fearful dog turn into a dog friendly pooch! We had worked with different trainers to little effect. In fact he got worse after we enrolled in Cesar Millan's training center in Santa Clarita. It took a lot of homework and months of positive reinforcement but it was absolutely worthwhile. He went from wanting to lunge at dogs as soon as he seems them to wanting to smell every dog that he sees. He still gets nervous sometimes and does not like to play with dogs but I never would have imagined there would be a day where I can take him to a dog park. Listen to Hudson's advice and do the homework! He knows what he is talking about! Best dogs ever is THE reason why my dog is perfect! Hudson (the owner) is a very knowledgeable guy who can teach you everything about dogs social skills. I recommend him to anyone who just got s dog or someone who is having trouble with there dog. Him sharing his knowledge is worth the money! My Boston Terrier Bosley needed some education on manners. Hudson's said, "There's a difference between manners and obedience." Anyone who has a dog will be nodding their hear right now! he is full of powerfully wise information and how to's. His positive psychology attitude works (I'm a therapist and I learn a lot from Hudson about human behavior!) and it transformed the life of my dog who is much happier now and our house is full of happy calm and excitement, not anxious excitement. I think it's so rare to find someone personable and so incredibly knowledgeable. 5 minutes with Hudson is like watching 5 episodes of The Dog Whisperer. Seriously, I learned so much and I am over the moon Hudson is part of my dog's life. He's a fun guy too, which is also why I think learning is so easy -- for both me and my dog! Then last week I rescued a puppy and Hudson super dog hero demi dog god whisperer (!) came to teach me all about how to raise a happy little one. While I've brought up two puppies before and been to lessons, I was blown away by how much I learned. He also gives you a checklist of what will help you as the carer, a great easy to use pamphlet and puppy training book. I was seriously impressed. Of course my little pup took to him like he was Santa Claus and what I was struggling with for 2 days, the crate training, was solved in about 7 minutes! What's so nice is now I am training both my little girl pup and Bosley (above) and they are learning together. I think if more of us saw Hudson, we'd have a much happier doggy world and less abandoning of dogs. As he says, dogs aren't bad, they're not into revenge, they just need us to show them what's acceptable and what isn't. There's no shouting required. It's awesome! It's a truly happy experience and not at ALL stressful looking after the little one, who again seems happy calm not happy crazy excitement crazy puppy! Thank you so much Hudson for bringing such enormous joy to our dear sentient being friends, and their sentiment being carers. We ALL appreciate YOU! Our Black Lab "Samson" would not come when called. He would take off running toward other dogs as soon as he set eyes on them and not respond to any command. He pulled on the leash when we walked him, especially when other dogs were nearby. We tried a choke chain and pinch collar as well as trying to discipline by scolding him. None of it worked. Hudson showed us a new way to train him with positive reinforcement and rewards and it worked!! Now Samson will come when called even if he is in mid stride while taking off or pulling to play with another dog. Hudson is passionate about what he does and very good at it and we are very grateful for all his help. Highly recommended. Hudson is awesome and very passionate about his work. Our 5 month old Wheaten Rescue Jaxxson has some serious A.D.D. Hudson was very patient and worked diligently with him to get basic obedience skills down. We know feel safe to take our precious little monster to the dog park, beach and canyon hikes with the confidence he will come when called. You rock Hudson. And those turkey meatball are pretty tasty too. Thanks to Hudson who helped my dog with her 2 second attention span get some focus. Even when she challenged Hudson, he never gave up, even brought his family along to work with us on her issues. His methods are positive reinforcement, never aggressive or pain inducing (no electric collar or pinch and prong which others had suggested I do), and his tone with a dog who is testing his patience is always calm and upbeat. He worked with my dog first, then transferred over to working with me. He also explained things about a dogs temperament that for the first time explained what might be going on in my dog's mind. If you are looking for a trainer who your dog will love and not fear, he's the one for you. Hudson is fantastic and has been so helpful to us and our dog. Our young rescue dog was difficult to walk, aggressive with people we passed, lunged at other dogs, and often growled at guests at our house. After working with Hudson, he is so much calmer and it is now actually enjoyable to take him for a walk. And most importantly, our dog is enjoying himself more now, too. Hudson also taught us some really fun tricks to teach our dog and our kids are having a great time with that. All of Hudson's methods are positive and fun. Our dog has loved every minute of it. He is also always available to answer any questions. I can't recommend Hudson enough! Have had Hudson to our house two times to help with our golden retriever puppy. His methods and new ideas for dealing with our dog's mouthiness problems as well as his resource guarding were excellent. Highly recommend. Hudson is SO great! We have two crazy little chiweenies, and a baby on the way, so we desperately needed our dogs to behave. He takes the time to go through each step in great detail with us, and demonstrates with our dogs the appropriate actions. He also definitely goes above and beyond- even sending me articles about how to help our dogs adjust to a new baby! I would highly recommend him for any pet training needs. Hudson spent time with me and my dog Annie. Trust me, I am the most clueless dog owner ever! But he made everything seem easy! He broke it down and taught it to both of us and now we both enjoy life so much more! No one had ever explained things that way to my dog or to me. He has a magical gift that truly amazed me. Worth every penny and more! I will never let anyone else besides BEST DOGS EVER work with my dogs again! Move over Cesar! We have a wild 10-month-old Lab puppy who was on probation until we found Hudson through Yelp reviews. He came over once and showed us some things that made total sense and were very effective. We liked his way with the puppy and the fact that there was no hard sell to sign up for anything. He was patient, full of information and obviously in tune with dogs - we highly recommend Best Dogs Ever. And we're keeping the dog! I've only had 1 phone call with Hudson, but it was enough to know that he knows his stuff. We have always had dogs and know the basics about dog training a rescue dog, but our latest rescue dog has us stumped. No one seemed to be able to help us with our odd problem. Decided to try Hudson based on his excellent yelp reviews and was not disappointed. He was able to diagnose the issue just from a phone conversation. Even our vet couldn't tell us what was going on. Hudson gave me some advice on how to handle it, and although it will be a difficult fix, we've already had a minor breakthrough. Would absolutely recommend him to others. Hudson is the best!! No lie, I have had 5 dog trainers fail! It took Hudson 1 visit with me and my dog. I was unable to walk my dog (a beautiful energetic pit-bull) because she would literally drag me down the street. Therefore, she would rarely get exercise outside the house. Now, we walk everyday. It is so nice to be able to enjoy a walk with your dog. Hudson, I can't thank you enough! Thanks again! Hudson has made an extraordinary difference in our dogs and our lives in a short time. Both our dogs are 6 year old rescues and have both had previous training with not good results. Hudson has managed to train us to train both dogs with only positive, clear direction. Our chow mix has transformed from a somewhat aggressive, unpredictable and pushy dog into an obedient and easy going companion while supporting our other dog as well. Both dogs are eager to please us and to play and I look forward to the continued success with Hudson. Oh, that we had found him before but we are thrilled with the results now! In preparing for the arrival of our male Rhodesian ridgeback puppy, we met with a few trainers. It was a snap decision to move forward with Hudson Shock. We started with his puppy 101 class before we even got our pup (and I highly recommend it.) We were so well prepared! Knowing that we'd soon have a HUGE dog in our home, it was important to us to start training from the the very beginning. We worked with Hudson weekly for the first few months and also took his beginner and intermediate group classes. I was truly fascinated watching and learning from Hudson. Our pup took to each new lesson very quickly, but when he had a problem with "stay", Hudson came at it a few different ways until it worked... in five minutes flat! Hudson has a miraculous way of reading a dog's energy... every little nuance... and then uses it to accomplish learning something new. Hudson is also available by phone or email anytime you have a quick question. Our dog LOVES Hudson. We all learned so much. I've had dogs my whole life but had never worked with a trainer before. My kids, my husband, my dog and I all give Hudson FIVE STARS! I can't say enough good things about Hudson. His training method is all about positive reinforcement, love, and joy, and providing alternative good behaviors for any troublesome ones. My dog Mimi is crazy about him, and while she was always a well-behaved dog, now she's even better. Most importantly, he's provided ME with the tools to deal with any situation that arises with her, and to do so in a positive, constructive way. I would strongly recommend Best Dogs Ever to anyone, with any kind of dog. We saw remarkable results with our super, high-energy yellow lab after only a few sessions. We've had her for nearly two years and tried several different training programs. Our experience with Hudson was the most positive, and most transformative, by far! Our rambunctious little darling used to constantly pull on walks and lunge at other dogs (out of excitement) and jump on people. She just had so much energy! Now, when we're walking her, people actually stop and compliment us on how well behaved she is. Hudson is a miracle worker. Hudson trains my German Shepard puppy. Hudson is a life saver! My puppy, like other puppies, is on the go, full of energy and wants to go in every direction. Hudson taught him how to sit, how to stay, how to leave things, how to walk on a leash, how not to jump on people, etc. He helped me get the right food, the right crate, the right leash, and the right everything else. He is always upbeat and positive. My puppy loves Hudson!!!!! Hudson trains my puppy with love and encouragement and helps my puppy socialize with people and other dogs and stay calm in situations. Hudson is calm, happy, and he is honest, directly and has integrity. He taught my puppy and teaches me things and life along the way. The best thing I did was pick Best Dogs Ever - Hudson to train Ruby! She is a pretty smart Chinese Crested but she was also pretty hyper and stubborn. We had learned to do what she wants rather than her doing what we want. Hudson has been training her to be my service dog and we couldn't be happier! Hudson has trained Ruby, my husband, and I to do everything we need plus! Ruby is happier, we are happier, and I have a lot more freedom. Hudson's methods are amazing, no matter what she does he can make it so she feels she is choosing to do what we want not being forced. She has gone from a very happy, hyper, out of control dog, that was hard to take anywhere. To the even happier, mellow, well behaved, pleasure to take everywhere, and she is giving me new found freedom I haven't had in over 8 years! If you are considering training your dog, check out Best Dogs Ever! 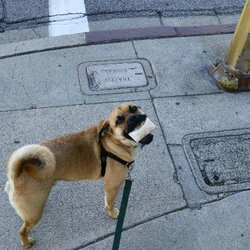 If you have a dog and want to enjoy them more, call Hudson! If you want your amazing perfect dog to be even more amazing, email Hudson! As far as I am concerned any pet we have from now on will be trained by Hudson!!! Best Dogs Ever is so far above all others that he can't even see them! UPDATE: Ruby's training is almost done and I have been taking her every where I go and she has been amazing! She has more confidence, more control, and is a pleasure to have with me. Thanks to Hudson I am able to go out where I want, when I want and Ruby is calm and well behaved. Hudson shows his knowledge, understanding, and loving nature in every thing he does. You will be as thrilled with the results as we have been. If I could give a higher rating I would gladly rate him higher because he deserves it!! :) I have trained our dogs in the past but sadly (or happily) I am no longer able to train them. So I searched for a dog trainer who would not only be able to understand my young, hyper, happy, Chinese Crested, but would also be able to understand our needs for her. I wanted her to be my service dog :) but I wasn't sure she would be able to calm down well enough to go everywhere with me. Well silly me, I might of had a reason to worry if I had trained her or hired a different trainer but I did something right and hired the best trainer EVER!!! Hudson Shock is such an incredible trainer; he has Ruby doing what she is told, has my husband and me following his directions (if you knew us you would understand what an incredible thing this is!). In two short weeks Ruby has gone from an amazing wild and crazy girl to an amazing well behaved sweetheart. She is still getting used to being a service dog but today she was so good when I went out for lunch. I am so proud of her!!! The best thing I did was pick Best Dogs Ever - Hudson Shock to train my Ruby!!! Thanks completely to Hudson she is giving me new found freedom I haven't had in over 8 years!!! If you are considering training your dog, check out Best Dogs Ever!!! If you have a dog and want to enjoy them more, call Hudson Shock!!!! If you want your amazing perfect dog to be even more amazing, email Hudson Shock!!! In other words if you have any pet at all and want to enjoy them to the max contact HUDSON SHOCK of BEST DOGS EVER!!!! I always wonder if these reviews are real, I am not related to Hudson in anyway at all. We met when he came to our home to evaluate Ruby for one on one training. As far as I am concerned any pet we have from now on will be trained by Hudson!!! I can't stress enough, he is so far above the rest that he can't even see the rest!!!! We never would have believed the transformation in our dog if we hadn't witnessed it taking place! Soon after we got our puppy, we realized that we had absolutely no abilities to train him without help. A friend recommended Hudson Shock (bestdogsever.com) and we called him. We haven't looked back since. Thanks to Hudson's efforts, our "Buddy" has transitioned into a near perfect gentleman! In a period of a few weeks, Hudson has calmed Buddy, made him very responsive to our wishes, and in general shaped him into the dog we had originally hoped to have. Hudson accomplishes everything with absolute kindness. Watching him work is like watching poetry in motion. His knowledge and patience have no limits. We recommend Hudson Shock very highly to anyone who wants to train their dog with love and kindness. His abilities are nothing short of terrific! Honestly, Hudson Shock completely rewrote the book for our anxious, fearful terrier cross. we had initially taken a private trainer when the dog was a young pup and had mistakenly laid down all the wrong enforcements for a dog of his particular type. Hudson showed us the power of positive reinforcement and we have been reaping the positive benefits from day 1. we have him work with our family, listening, digesting and prescribing the right approach and also have him come in 4 days a week for 1 month. he is without doubt the most professional, successful, humanistic and competent trainer I've come across. he is a great guy. Do you and your dog a favor - hire Hudson now! Don't go another day in frustration. Most issues can be resolved. My husband and I adopted a very high-energy and untrained shelter dog named Finn. The shelter gave us a laundry list of misdeeds Finn had committed from Finn's prior owner. She was afraid to get into the car. She couldn't go up or down steps. Walking her was like holding a fly on the end of a thread - a barking fly. She wouldn't leave our 20-year-old dog alone, which created a lot of stress in the house. And yet she was timid around people. By day three I was wondering what we had done. But we loved her from the moment we met and knew she was worth every effort. We called Hudson immediately. Now Finn loves the car. She runs up and down our steps, sometimes taking four steps at a time - she flies! She also loves having people over for a visit. When the doorbell rings, she wags her tail and gets a big smile. We now have much more control of her on walks and she is very well-behaved in other's homes. And she has finally stopped pestering our aging second dog. She is transformed, with a happy and outgoing demeanor. Hudson will give you the tools to make it happen, it is worth every bit of time you put in. Finn loved Hudson's visits, she once waited for him at the door for 20-minutes after he left. Most importantly, I completely entrusted Hudson with my dog and her safety. Start now, you (and your dog), will be happy you did. I'm so glad that I hired Hudson to work with my dog!! My only regret was not hiring him sooner. I love that he only uses positive reinforcement too!! We had two big issues that we needed to work on, my dog was pulling on the leash and she also jumps on people to greet them. Hudson worked with my girl for three weeks and both problems were solved. As a matter of fact, my dog responded so well to her training with Hudson, we've started agility training! I never thought my dog could handle a group class (she wants to love on everyone and every dog she meets) but with the new techniques we are using, she is an absolute delight to work with in class and who knows, I may have the next agility champion living with me. "I absolutely LOVE working with Hudson Peanut is a different dog since we started training with him. Peanut is 1-1/2 year old miniature dachshund rescue. Before adopting him, I was so worried that it would be difficult to train an adult dog. I called Hudson PRIOR to adopting Peanut, and even before we began formally training, he was willing to talk with me and put me at ease. He assured me that even and old dog can learn new tricks. He was completely right! With positive training methods, Peanut has learned to listen to my commands even during stressful situations for him. Training has strengthened or bond and made Peanut's transition to our home so easy. I would strongly urge anyone with a rescue or new dog to train with Hudson You won't be disappointed!" Hudson is amazing and will have your dog behaving liked you always hoped they would - or at least that's how things worked out for me. It took work, but now Charlie (my miniature dachshund) and I are so much closer and we both know each other better. The best thing about Hudson's methods, is that they are all reward based, so everything we learned to do, to modify behavior for the better was positive - so it didn't stress me or Charlie. Charlie was actually eager to practice his training and he picked up his new tricks quickly. Overall, so glad that I called Hudson He came to my rescue and now my 'sometimes land shark' dachshund, is a braver, more predictable and well behaved dog. If you're having some issues with your dog, definitely give him a call, you'll be glad you did :)"
Best Dogs Ever depends on satisfied clients like you and your dogs to let the world know about your experiences with us. Your dog (probably) can't type, so it's up to you! Please follow the links to leave a review on these sites so BDE can help other dog owners just like you.